Our Basics range of Elegant Sterling Silver Rings for Men and Ladies 925 designs of Silver Ring. Silver Basics Rings including Plain bands, designer Simple solid Rings, Basic Modern Curve minimalistic Design Silver Elegant Rings. Sterling Silver Ring incorporating the word 'friends' into design 925. MULTI BAND STERLING 925 SILVER RING. 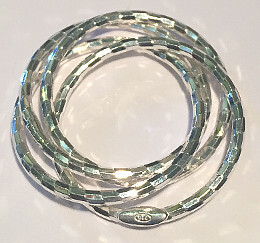 Sterling Silver Bands interconnected to form an elegant fashionable Ring with a Faceted reflective finish. Large Sterling Silver Band ring with 925 stamped on outside of ring. Excellent design 925 stamp on ring. Sterling .925 Silver Large Band Ring. Simple Twist Knot style Sterling Silver Ring. Sterling Silver elegant Buckle design 925 Ring. 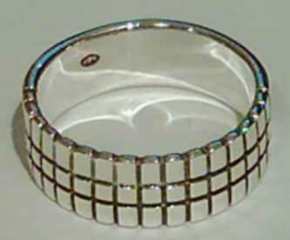 Sterling Silver 925 Heavy GRID design ring. Modern fashionable design Large Sterling Silver ring. 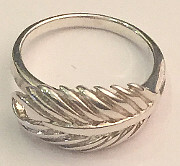 Sterling Silver 925 Ring with large Leaf design. Long Sterling Silver Wide Gothic design Goth Ring. 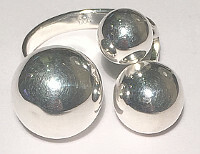 Large triple Ball designer Sterling Silver Ladies Ring. Open torque design 925 ring with a trio of different sized large balls forming an eye catching design. 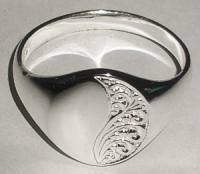 Sterling Silver Oval SIGNER Ring Large with Scroll pattern design. Sterling Silver Ring with Gold detail and fancy design. 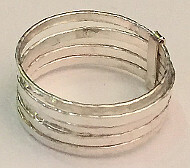 Sterling Silver hammered finish Stacked Multi Band Ring. 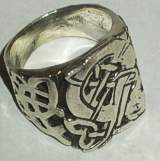 CELTIC style BAND Sterling SILVER Large Ring. 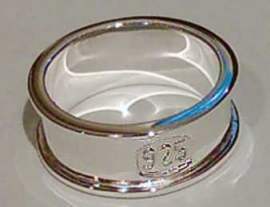 Flat Top Sterling Silver Ring Signet style 5mm-7mm wide 925 Ring. Sterling Silver Ring with polished Curve Design Top. Solid 925 Silver Curved designer band ring. Sterling Silver Scroll Twist design 9mm wide Band Ring. 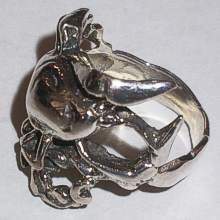 Sterling Silver detailed Scorpion Design Ring shaped like real Scorpion with Tail wrapping around as ring band. 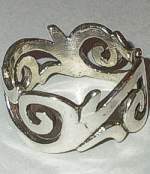 Sterling Silver Designer FILIGREE cut out Wide band Ring. Popular open cut out modern design 925 ring. 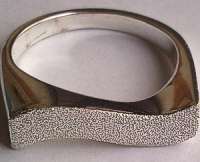 Sterling Silver Curved design Ring with Satin finish Glitter Top. Curved Round Top Sterling Silver solid polished designer Ring. 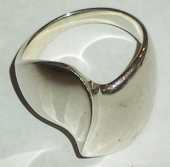 Elegant design rounded top wide 925 Silver Ring. Sterling Silver Hammer design Finish contemporary 925 band Ring. Sterling Silver Dome shape polished 925 stylish Ring. 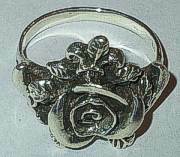 Sterling Silver Ladies large Rose design detailed Ring. 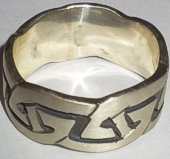 Sterling Silver wide Celtic design Ring with Celtic detail. Sterling Silver Wave Contemporary style polished Ring. Sterling Silver Aztec design wide Band Ring with Aztec style decoration all around ring band. Sterling Silver Square ring with Cut out holes in Top, our Modern Cube Ring. Sterling Silver polished Domed design Ring with Rim around edges of Ring. Sterling Silver Football design ring. 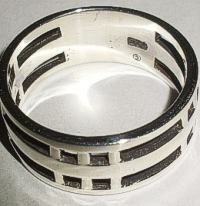 Silver Band with Black enamel Football design Ring. Sterling Silver open Stars band design Ring. Sterling Silver open Hearts band style 925 Ring. Single STAR design Sterling Silver Ring. Sterling Silver Flowers wide Ring with triple banded design on shank. Three detailed Flowers design on top of 8mm wide 925 ring. 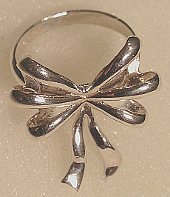 Sterling Silver Bow design Ring, approximately 12mm wide.